Properties: Crystals from hexane, mp 53.5-54°. Slightly sol in water, freely sol in organic solvents. LD50 i.v. in mice: 260 mg/kg (Irikura, 1973). Therap-Cat: Antiallergic; antiasthmatic; vasodilator (cerebral). Ibudilast is an anti-inflammatory and neuroprotective oral agent which shows an excellent safety profile at 60 mg/day and provides significantly prolonged time-to-first relapse and attenuated brain volume shrinkage in patients with relapsing-remitting (RR) and/or secondary progressive (SP) multiple sclerosis (MS). Ibudilast is currently in development in the U.S. (codes: AV-411 or MN-166), but is approved for use as an antiinflammatory in Japan. Ibudilast is a leukotriene antagonist and phosphodiesterase inhibitor which has been commercialized in Japan and other parts of Asia for over 15 years as capsules for the treatment of bronchial asthma and cerebrovascular disturbances. In 2000, the product was launched for the topical treatment of allergic conjunctivitis. 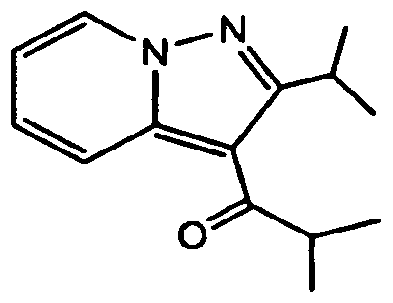 At present, the drug is undergoing phase II trials at MediciNova for the oral treatment of multiple sclerosis (MS), for the treatment of medication overuse headache (MOH), for the treatment of diabetic neuropathic pain, for the treatment of methamphetamine addiction and for the treatment of opioid withdrawal. Early clinical trials are ongoing for the treatment of amyotrophic lateral sclerosis as an adjunt to riluzole.MediciNova and the University of Colorado had been evaluating the product in preclinical studies for the treatment of post-traumatic brain injury; however, no recent development has been reported for this research.Ibudilast exhibits antiplatelet properties mainly by inhibiting phosphodiesterase V (PDE V), which in turn potentiates antiplatelet function of endothelium-derived nitric oxide (NO). The compound has also been shown to suppress hippocampal apoptosis induced by amyloid beta hypoxia. Ibudilast (development codes: AV-411 or MN-166) is an antiinflammatory drug used mainly in Japan, which acts as aphosphodiesterase inhibitor, inhibiting the PDE-4 subtype to the greatest extent, but also showing significant inhibition of other PDE subtypes. Ibudilast has bronchodilator, vasodilator  and neuroprotective effects, and is mainly used in the treatment of asthma andstroke. It inhibits platelet aggregation, and may also be useful in the treatment of multiple sclerosis. Ibudilast crosses the blood–brain barrier and suppresses glial cell activation. This activity has been shown to make ibudilast useful in the treatment of neuropathic pain and it not only enhances analgesia produced by opioid drugs, but also reduces the development oftolerance. It may have some use reducing methamphetamine and alcohol addiction. It may have some use reducing methamphetamine addiction. Avigen has identified the potential of ibudilast (AV-411) for the treatment of neuropathic pain and other neurological indications, including opiate withdrawal. As an inhibitor of glial cells, ibudilast can deactivate these cells which produce various chemicals, including proinflammatory cytokines, in response to nerve damage or viral infection to amplify and maintain pain. Preclinical evaluation to date indicates that it reverses the painful sensory abnormality allodynia in chemotherapy- and trauma-induced neuropathic pain models. Originator Kyorin and Banyu Pharmaceutical (now MSD KK following the merger of Banyu and Schering-Plough KK in 2010) have been developing ibudilast under a collaborative agreement. MediciNova obtained exclusive, worldwide rights outside of Japan, China, Taiwan and South Korea from Kyorin in October 2004 to develop and commercialize the compound for MS. In 2012, a codevelopment agreement was signed between MediciNova and the University of Colorado for the treatment of post-traumatic brain injury. Sixteenth revised Japanese Pharmacopoeia chemicals, etc. IBUDILAST　Ibudilast C14H18N2O: 230.31 [ 50847-11-5 ] that this product was dried when to quantify, including ibudilast (C14H18N2O) 98.5 ~ 101.0%. EXAMPLE 1 Synthesis of 2-isopropyl-3-is0butyrylpyrazolo[1,5-a] pyridine (KC404) A mixture of 1-amino-Z-methylpyridinium iodide g.), isobutyric anhydride (500 g.) and K CO (81 g.) was refluxed for 8 hr. After cooling, the precipitated crystals were filtered off and water was added to the filtrate, The solution was made basic to pH 11 with K CO’ and extracted with ethyl acetate (1000 ml.). The extract’was washed with water (400 ml. ), dried over Na SO and concentrated under reduced pressure. The residue was distilled to give 58 g. of colorless crystalline product, hp, 110- 175 (7.5 mm. Hg). Recrystallization from hexane gave colorless prisms, melting point 53.554. FIG. 6 is a synthetic reaction scheme illustrating one approach for preparing (S)-AV1013; the approach employs chiral chromatography of an N-protected form of the racemate as described in detail in Example 1. FIG. 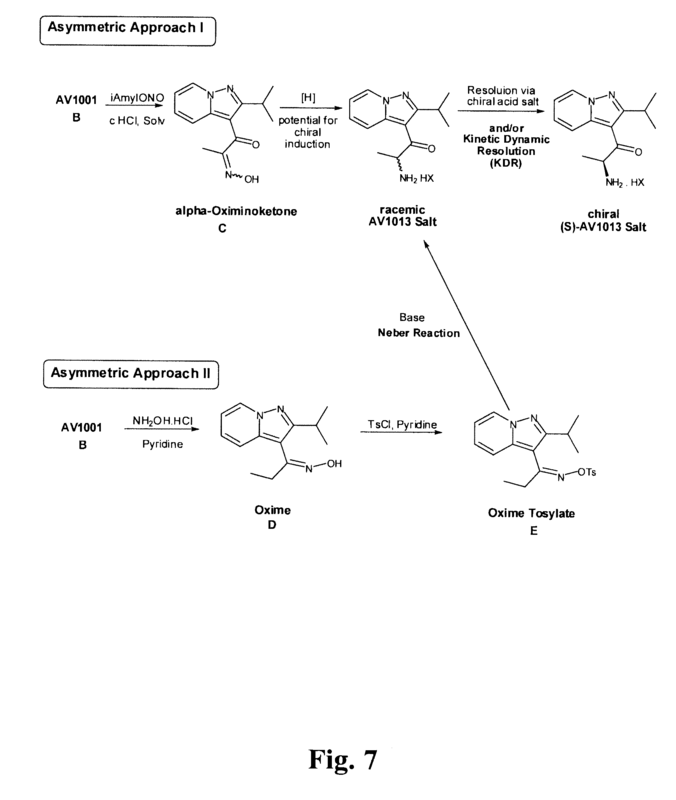 7 demonstrates additional reaction schemes for synthesizing (S)-AV1013. 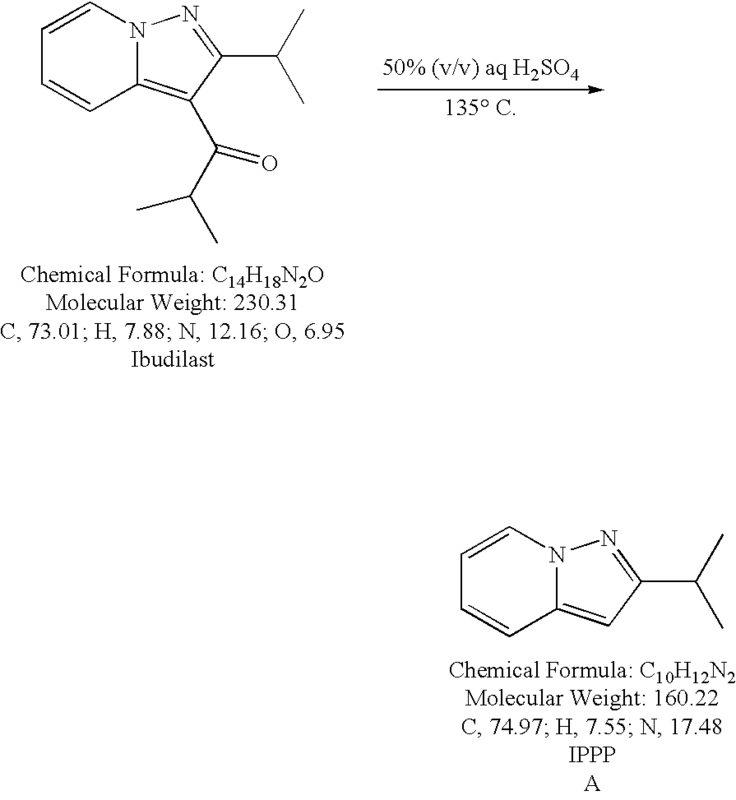 (S)-2-Amino-1-(2-isopropylpyrazolo[1,5-a]pyridin-3-yl)propan-1-one hydrochloride (also referred to herein as S-AV1013.HCl) was prepared on a preparative scale using two different routes to obtain the intermediate isopropylpyrazolo[1,5-a]pyridine (IPPP). In the first approach (method 1), ibudilast was employed as the starting material to obtain IPPP; an alternate synthetic approach (method 2) employed ibudilast acid as the starting material. A 5 L 3-neck round-bottom flask was equipped with a mechanical stirrer, thermocouple, heating mantle and a Y-adapter with a nitrogen inlet. The flask was charged with water (350 mL, USP), concentrated sulfuric acid (350 mL) and ibudilast (3-isobutyryl-2-isopropylpyrazolo[1,5-a]pyridine) (140 g, 0.608 mol). The flask was purged with nitrogen, and the mixture was stirred while it was heated to 135° C. An aliquot was removed for HPLC analysis, which showed that all starting material was consumed after 5 hours at 135° C., so the mixture was allowed to cool to room temperature overnight. The mixture was cooled in an ice bath, and water (1400 mL, USP) was added over 10 min, with the temperature maintained below 25° C. With continuous cooling in an ice bath, the mixture was neutralized by adding sodium hydroxide (50% w/w aq., 1150 mL) dropwise, with the temperature maintained below 25° C. Ethyl acetate (250 mL) was added, and the layers were separated. The aqueous layer was washed with ethyl acetate (2×300 mL). The combined ethyl acetate extracts were washed sequentially with 250 mL portions of saturated aqueous sodium bicarbonate and saturated aqueous sodium chloride, then dried over anhydrous sodium sulfate for 30 minutes. Activated carbon (20 g) and silica (60 g) were added and stirred before filtering over a pad of Celite. The filtrate was concentrated under reduced pressure to obtain 96.5 g of IPPP (2-isopropyl-pyrazolo[1,5-a]pyridine, 99% crude yield, 99.6 area % pure by HPLC) as an amber oil. 1H-NMR (CDCl3) δ 1.4 (d, 6H), 3.2 (m, 1H), 6.3 (s, 1H), 6.6 (t, 1H), 7.0 (m, 1H), 7.4 (d, 1H), 8.4 (d, 1H). HPLC: RT=9.1 min (99.6 area %). 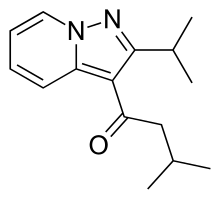 Ibudilast (3-isobutyryl-2-isopropylpyrazolo[l,5-α]pyridine) is a small molecule drug that has been used for many years in Japan and Korea for the treatment of bronchial asthma as well as for treatment of cerebrovascular disorders such as post-stroke dizziness. It is sold in these countries under the tradename, Ketas®. Marketed indications for ibudilast in Japan include its use as a vasodilator, for treating allergy, eye tissue regeneration, ocular disease, and treatment of allergic ophthalmic disease (Thompson Current Drug Reports). Its use in the treatment of both chronic brain infarction (ClinicalTrials.gov) and multiple sclerosis (News.Medical.Net; Pharmaceutical News, 2 Aug 2005) is currently being explored in separate, ongoing clinical trials. Ibudilast is a small molecule drug (molecular weight of 230.3) having the structure shown below. Ibudilast is also found under ChemBank ID 3227, CAS # 50847-1 1-5, and Beilstein Handbook Reference No. 5-24-03-00396. Its molecular formula corresponds to [Ci4HIgN2O]. Ibudilast is also known by various chemical names which include 2- methyl-l-(2-(l-methylethyI)pyrazolo(l,5-a)pyridin-3-yl)l-propanone; 3-isobutyryl-2- isopropylpyrazolo(l,5-a)pyridine]; and l-(2-isopropyl-pyrazolo[l,5-a]pyridin-3-yl)-2- methyl-propan-1-one. Other synonyms for ibudilast include Ibudilastum (Latin), BRN 0656579, KC-404, and the brand name Ketas®. Ibudilast, as referred to herein, is meant to include any and all pharmaceutically acceptable salt forms thereof, prodrug forms (e.g., the corresponding ketal), and the like, as appropriate for use in its intended formulation for administration. Ibudilast is a non-selective nucleotide phosphodiesterase (PDE) inhibitor (most active against PDE-3 and PDE-4), and has also been reported to have LTD4 and PAF antagonistic activities. Its profile appears effectively anti-inflammatory and unique in comparison to other PDE inhibitors and anti-inflammatory agents. PDEs catalyze the hydrolysis of the phosphoester bond on the 3 ‘-carbon to yield the corresponding 5′- nucleotide monophosphate. Thus, they regulate the cellular concentrations of cyclic nucleotides. Since extracellular receptors for many hormones and neurotransmitters utilize cyclic nucleotides as second messengers, the PDEs also regulate cellular responses to these extracellular signals. There are at least eight classes of PDEs: Ca2+/calmodul in-dependent PDEs (PDEl); cGMP-stimulated PDEs (PDE2); cGMP- inhibited PDEs (PDE3); cAMP-specific PDEs (PDE4); cGMP-binding PDEs (PDE5); photoreceptor PDEs (PDE6); high affinity, cAMP-specific PDEs (PDE7); and high affinity cGMP-specific PDEs (PDE9). By condensation of 1-amino-2-methylpyridinium iodide (I) with isobutyric anhydride (II) by means of K2CO3 at reflux temperature. 2-methyl -l- [2- (l- methylethyl) – pyrazolo [l, 5_a] pyrimidine _3_ yl] _1_ acetone (ibudilast, generic drug name: IBUDILAST ) is an anti-allergic asthma drugs, anti-leukotrienes can twist and platelet-activating factor, promote the secretion of mucus in the respiratory tract, respiratory cilia function, enhance the role of prostacyclin, increase cerebral blood flow, improve brain metabolism. For the treatment of bronchial asthma, sequelae of cerebral embolism, cerebral arteriosclerosis. The route to 2-picoline as starting material to give amino-2-methyl-pyridine iodide I-, after pyrimidine, the role of isobutyryl chloride to give the title compound. The final product obtained by this route need be purified by column chromatography, thereby increasing the difficulty of the operation, in addition to column chromatography, eluent used larger benzene toxicity, is not suitable for industrial production. The route to 2-picoline as starting material to obtain the sulfamic acid, potassium iodide I- amino-2-picoline under the action of potassium carbonate, then with isobutyric anhydride to give the title compound effect. This route of the first-stage reaction process locked, the yield is low, is not suitable for industrial production. so there ibudilast conventional method for preparing the operational difficulties or low yield, making it impossible to achieve industrial production problems. DETAILED DESCRIPTION IX: with a specific embodiment of the present embodiment is one of one to eight different points: in the second step of the recrystallization specific operation is as follows: First, the collected fractions was cooled to 10 ° c~25 ° C, to give a pale yellow solid, and then n-hexane was added to the pale yellow solid, and the temperature was raised to 50 ° C~68 ° C, at a temperature of 50 ° C~68 ° C incubation 5min~IOmin, then cooled to 10 ° C~ 25 ° C, and at a temperature of 10 ° C~25 ° C incubated O. 5h~Ih, and finally filtered to obtain ibudilast; the volume of the pale yellow solid quality and hexane ratio of Ig: (ImL~2mL), to obtain ibudilast. 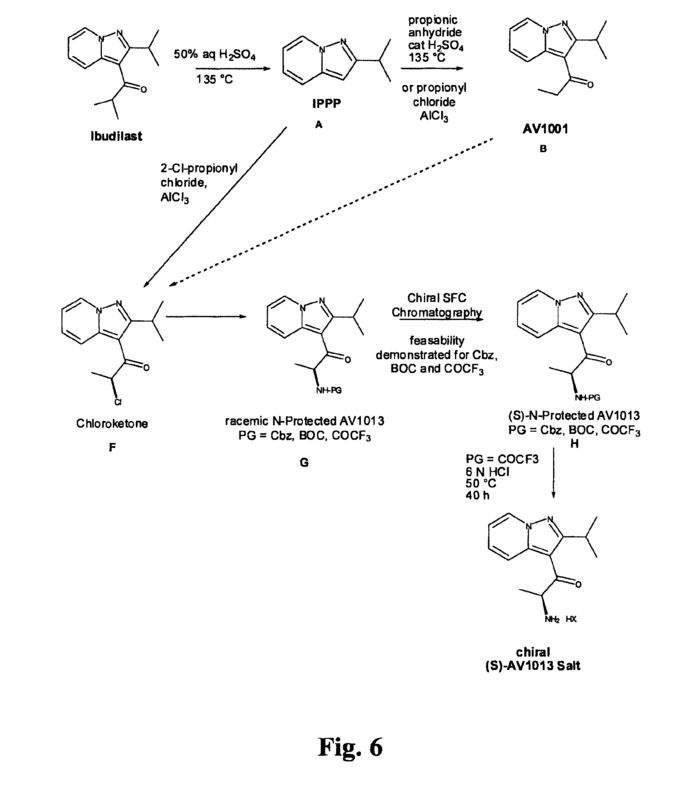 Bioorganic & medicinal chemistry letters (2011), 21(11), 3307-12. Ibudilast [1-(2-isopropylpyrazolo[1,5-a]pyridin-3-yl)-2-methylpropan-1-one] is a nonselective phosphodiesterase inhibitor used clinically to treat asthma. Efforts to selectively develop the PDE3- and PDE4-inhibitory activity of ibudilast led to replacement of the isopropyl ketone by a pyridazinone heterocycle. Structure–activity relationship exploration in the resulting 6-(pyrazolo[1,5-a]pyridin-3-yl)pyridazin-3(2H)-ones revealed that the pyridazinone lactam functionality is a critical determinant for PDE3-inhibitory activity, with the nitrogen preferably unsubstituted. PDE4 inhibition is strongly promoted by introduction of a hydrophobic substituent at the pyridazinone N(2) centre and a methoxy group at C-7′ in the pyrazolopyridine. Migration of the pyridazinone ring connection from the pyrazolopyridine 3′-centre to C-4′ strongly enhances PDE4 inhibition. These studies establish a basis for development of potent PDE4-selective and dual PDE3/4-selective inhibitors derived from ibudilast. MediciNova has received rare paediatric disease status from the US Food and Drug Administration (FDA) for its MN-166 (ibudilast) to treat Type 1 Early Infantile Krabbe disease. Huang Z, Liu S, Zhang L, Salem M, Greig GM, Chan CC, Natsumeda Y, Noguchi K. Preferential inhibition of human phosphodiesterase 4 by ibudilast. Life Sciences. 2006 May 1;78(23):2663-8. Suzumura A, Ito A, Yoshikawa M, Sawada M. Ibudilast suppresses TNFalpha production by glial cells functioning mainly as type III phosphodiesterase inhibitor in the CNS. Brain Research. 1999 Aug 7;837(1-2):203-12. Gibson LC, Hastings SF, McPhee I, Clayton RA, Darroch CE, Mackenzie A, Mackenzie FL, Nagasawa M, Stevens PA, Mackenzie SJ. The inhibitory profile of Ibudilast against the human phosphodiesterase enzyme family. European Journal of Pharmacology. 2006 May 24;538(1-3):39-42. Kishi Y, Ohta S, Kasuya N, Sakita S, Ashikaga T, Isobe M. Ibudilast: a non-selective PDE inhibitor with multiple actions on blood cells and the vascular wall. Cardiovascular Drug Reviews. 2001 Fall;19(3):215-25. Mizuno T, Kurotani T, Komatsu Y, Kawanokuchi J, Kato H, Mitsuma N, Suzumura A. Neuroprotective role of phosphodiesterase inhibitor ibudilast on neuronal cell death induced by activated microglia. Neuropharmacology. 2004 Mar;46(3):404-11. Yoshioka M, Suda N, Mori K, Ueno K, Itoh Y, Togashi H, Matsumoto M. Effects of ibudilast on hippocampal long-term potentiation and passive avoidance responses in rats with transient cerebral ischemia. Pharmacological Research. 2002 Apr;45(4):305-11. Wakita H, Tomimoto H, Akiguchi I, Lin JX, Ihara M, Ohtani R, Shibata M. Ibudilast, a phosphodiesterase inhibitor, protects against white matter damage under chronic cerebral hypoperfusion in the rat. Brain Research. 2003 Nov 28;992(1):53-9. Rile G, Yatomi Y, Qi R, Satoh K, Ozaki Y. Potentiation of ibudilast inhibition of platelet aggregation in the presence of endothelial cells. Thrombosis Research. 2001 May 1;102(3):239-46. Feng J, Misu T, Fujihara K, Sakoda S, Nakatsuji Y, Fukaura H, Kikuchi S, Tashiro K, Suzumura A, Ishii N, Sugamura K, Nakashima I, Itoyama Y. Ibudilast, a nonselective phosphodiesterase inhibitor, regulates Th1/Th2 balance and NKT cell subset in multiple sclerosis. Multiple Sclerosis. 2004 Oct;10(5):494-8. Ledeboer A, Hutchinson MR, Watkins LR, Johnson KW. Ibudilast (AV-411). A new class therapeutic candidate for neuropathic pain and opioid withdrawal syndromes. Expert Opinion on Investigational Drugs. 2007 Jul;16(7):935-50. Shandong Huagong (2014), 43, (8), 29-30. Publisher: (Shandong Huagong Bianjibu, ) CODEN:SHHUA4 ISSN:1008-021X. Leukotriene D4 antagonist. Prepn: T. Irikura et al., DE 2315801; eidem, US 3850941 (1973, 1974 both to Kyorin). Pharmacology and antiallergic activity: K. Nishino et al., Jpn. J. Pharmacol. 33, 267 (1983); H. Nagai et al., ibid. 1215.
in vivo activity: W. M. Armstead et al., J. Pharmacol. Exp. Ther. 244, 138 (1988). Bronchodilating activity in animals: S. Mue et al., Arch. Int. Pharmacodyn. 283,153 (1986). Antiplatelet activity in animals: M. Ohashi et al., ibid. 321; M. Ohashi et al., Gen. Pharmacol. 17, 385 (1986). Keywords: Antiallergic; Antiasthmatic (Nonbronchodilator); Leukotriene Antagonist; Vasodilator (Cerebral). In some ground-breaking research, scientists have been able to use stem cells derived from human muscle tissue to repair nerve damage and restore function after injury to sciatic nerves. And, even after 12 weeks, the regenerated nerve looked and functioned as a normal nerve. BioMarin will be celebrating news that regulators on both sides of the Atlantic have agreed to review Vimzin under accelerated review processes. Vimzin is an enzyme replacement therapy for which the drugmaker is seeking approval as a treatment for the rare lysosomal storage disorder Mucopolysaccharidosis Type IVA (MPS IVA), also known as Morquio A Syndrome. During an initial review of the Biologics License Application the US Food and Drug Administration requested extra Chemistry, Manufacturing and Controls information, and following receipt of this from BioMarin it has extended the PDUFA action date by three months to February 28 next year. In the EU, assuming the marketing application remains on the accelerated assessment timeline, a CHMP opinion is anticipated in December this year, which means a decision from the European Commission could be handed down in the first quarter of 2014, the firm said. The estimated prevalence of MPS IVA is around 3,000 patients in the developed world, and it is believed that around 20% or patients are in North America and 50% in Europe.